Every youth leader needs a bevy of Christian games and activities on hand for youth group. Keeping a 'stock' of youth group ideas to use in a pinch will prove to be a lifesaver. Design your activities with your group members' ages in mind, and the kids will have fun no matter how silly or serious the activities are. Who said Christian youth groups can't be a little on the silly side? These types of activities can help to bring shy individuals out of their shells and get them to participate in future activities. This is a relay game using bubble gum and a piece of paper affixed at an easily reachable height on the wall for all players for each team. Each player has to race to a table on the other side of the room. They then have to pick up a piece of bubble gum, unwrap it and start chewing it. They then have to blow a bubble and stick it to a piece of paper on the wall for their team using only their mouth. (No hands allowed). The team who finishes first wins. This can be more difficult if you use old-fashioned bubble bum, such as Bazooka. Let your imagination guide you in playing various games dedicated to the New Year. Have baby bottle races. Fill baby bottles with juice and players have to drink it to see who can finish first (use 4-ounce bottles). Players can also have a baby buggy race to see who can cross a finish line first with a player pushing and the other player riding in a baby buggy (stroller). Guess That Baby is another game where all attendees have to post a picture of themselves as babies on the wall. Everyone has to guess who the babies are. Participating in age-appropriate board games can be a fun activity for youth group members. Consider setting aside time during one gathering per month or quarter to dedicate to playing time-tested traditional or religious-theme board games. Christian board game options include Bibleopoly, Outburst Bible Edition, and Proverbial Wisdom Bible Edition. Fellowship is a favorite activity, especially for new members who don't know everyone. 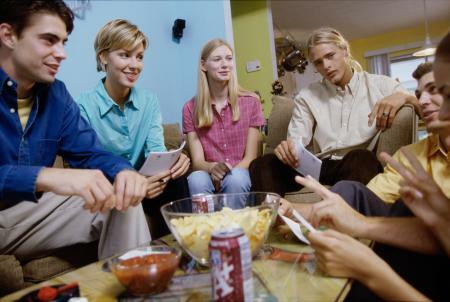 The following activities will help youth group members get to know each other better. These dinners require the members involved to visit each other's homes for a specific course of a meal. This activity will require parents or chaperones to be involved to assist with transportation. Each participant makes one course of the meal or provides a form of entertainment. This activity gets everyone involved, from the youth ministry leader to the parents and other members of each family. Plan to spend 20 minutes to a half-hour at each person's home. Assigned teams have to find an item that corresponds to each letter of the alphabet. This game works well outdoors in warm weather because the teams can get creative finding the items. As each team discovers an item, they have to get it approved by a youth leader. This game gets more difficult as the end of the alphabet approaches. The team that finishes the alphabet first (or can find the most corresponding items) wins. Divide the members into teams and give each group a list of items that they need to find. Be sure the list contains things they can reasonably find on the grounds of the church or in their own homes. Offer a prize to the first team that successfully collects all the items on the scavenger hunt list. 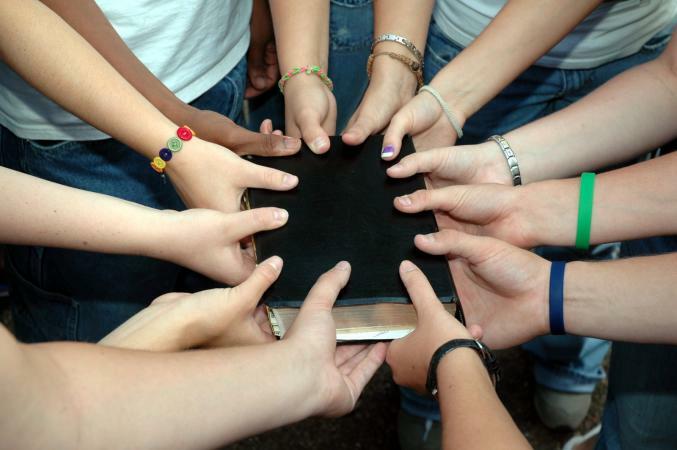 Youth group is, after all, focused on the church and should include Christian activities. When you're looking for something spiritual but not dull, consider playing a Bible game to get kids focused and excited about learning. Give group members a chapter in the Bible to memorize. Designate a set number of minutes to see how many verses they can memorize. The person who can memorize the most Bible verses in the set amount of time wins. You can also play this as a team; the group who can memorize the most verses will win. Give each team the exact same passages to read and learn about. Separate the teams to study. After a set amount of time, they will meet again and sit at separate tables. The youth leaders will ask the teams a set number of questions about the chapter they have studied. The team who answers the most questions correctly wins. They can respond to the questions by raising their hand or by using a bell. The team who signals first is allowed to answer first if they are wrong, the second team who has their hand raised (or rings the bell) gets to answer, and so on. The team that answers the most questions correctly, wins. Divide members into groups. Give each group a specific section of scripture to analyze. Have each group lead a discussion about the scripture and what it means. Have the youth group leader provide feedback to each group individually, recognizing participants for their unique contributions to the discussion. Sometimes the most important activities for your youth group are the ones that convey a message like kindness, love or compassion. These activities open the door to talking about the message behind them and why it is so important. Not only must we trust in God, but it is important to trust in one another. This activity will teach teens how to trust their friends and neighbors. Create multiple groups of 3-4 teens. Using their hands and verbal commands, the group will lead the blindfolded teen through the course. The blindfolded teen must follow the commands to try to make it through the course first. After the course is completed introduce the verse Psalm 56:3. When I was afraid, I put my trust in you. Have the youth explore together how they had to put their trust in one another. During the teen years, it's vitally important to think about being kind to one another. This activity will have youth thinking about ways to be kind to friends and strangers. Hand out the slips of paper. Have each person write their name on the paper. Put the slips of paper in a bag or hat. Have teens draw a name. They should keep it secret. Choose someone randomly to start. They should say something descriptively nice about the person whose name that they have drawn. While it should be descriptive, it should also be difficult enough to be hard for the other teens to guess who is being discussed. Teens should now guess who the person is. The person to guess right goes next. Continue until everyone has gone. When complete talk about how that made them feel. Another important message that needs to always be reinforced for youth is the importance of love and compassion. This activity can go along with several verses like 1 Peter 4:8. Create groups of 5 or 6. Have each group develop a short skit that shows an act of love or compassion. For example, they might show forgiving a friend that lied or giving food to a homeless person. Allow the kids to act out their skits. After each skit, talk as a group about the importance of love and compassion and why the teens chose that specific act for their skit. Youth Pastor: This site is filled with resources appropriate for youth pastors and others involved in youth ministry. You'll find a variety of games, lessons, reading and musical suggestions and more on this site. Youth Games: If you're primarily looking for games, this site is an excellent resource. You can browse the most popular and highest-rated games or use the searchable database to identify options specific to the age group and objectives you are working with. The Source for Youth Ministry: Visit this site when you are in need of ideas for icebreaker activities, games, discussion topics and other activities appropriate for youth groups. With so many available activity options, there's no reason to do the same things week after week. Help young youth group participants stay engaged and involved by providing a variety of age-appropriate faith-based activities on an ongoing basis.